West Coast Native tradition is proudly moulded into our valley and the naming of the August Jack Motor Inn continues with this tradition. The August Jack Motor Inn was named after a well known, popular Indian Chief, August Jack. Permission to use the name August Jack was given by his daughter Mrs. Frances (Louise) Williams and son Wilfred Williams, both Squamish residents. They were pleased and felt it a great honour to have their father’s name take a prominent place in the community. 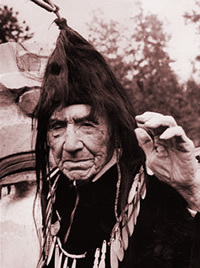 August Jack, hereditary Chief Khatsahlano (Xats’alanexw), was the last of forty great medicine men in the ancient order of the dancers of the Squamish Indians. He was born in Stanley Park, Vancouver and lived in what is now known as the False Creek area. August Jack and his wife Mary Ann lived in and around Squamish for many years where he was a boomman. He moved to the Capilano Indian Reserve for a time but eventually moved back to Squamish. He and his wife had their own home on the reserve in the North Yards. His daughter Louise said he was a great story teller and people often come from many parts of the province and elsewhere to visit him. His totem pole carving was a true work of art and a favourite pastime was to get away prospecting. A grandson Frankie Williams carries his grandfather’s Indian name. He had several other grandchildren and spent many hours with them. This man, well-loved by white and Native alike, died in Squamish on June 5, 1971. His age was not known for sure but he was thought to be well over 100 years old. His wife Mary Ann died here in April 1971. Some of his family still reside in Squarnish.